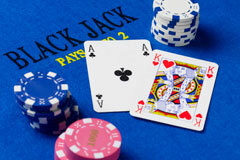 As stated before, there are tons of different strategies when playing Blackjack. Simply look on the web and you'll instantly know this is true. Some of the most common methods include the Martingale System, the Paroli System, the Oscar's Grind System, and the recently created Super Martingale Progression System. So, which method works the best? It's hard to say with complete certainty, especially because everyone's style is different. To be honest, there is no definite way to beat the house in Blackjack, unless you count cards. The reason is simple; these games are designed so that the casino has the upper hand. Even when you draw, the casino still makes a profit. This information isn't here to discourage you, but to let you know what you are up against. Here is a system that is fairly popular at a Blackjack table. It's called the Martingale System, and it can either win you a lot of money or make you lose a lot of money. The Martingale System is technically a simple system, although not a very successful one. roulette77zimbabwe.com. The concept is that when you lose, you double your bet for the next game. Ideally, when you do win, you'll end up making the money you lost as well as gaining some in the process. So, as long as you keep playing, when you win, you'll earn all of the cash you lost back, right? The problem with the Martingale System is that it doesn't take table limits into effect. If you double your bet every time you lose, there is a strong possibility that you will hit the limit. What happens when you hit that limit? There's nothing more to bet, and you'll end up being out of much more money than you intended. Truth is, all Blackjack systems are destined to fail. The odds are stacked too high against you, and the casino knows exactly how each strategy works so that they can stop it from being successful (like setting a table limit.) The only technique that is successful at evening the odds is counting cards. Counting cards is a foolproof and mathematical way to increase your chances of winning at Blackjack. Like any other system, counting cards has variations as well, so it is important to research how to count cards before you attempt it.